I have just completed this latest painting, and I must say, I am very fond of it. The two boys are Timmothy and Johnathon, at home in the kitchen "making cake"! I used the childrens own art in the background, portraits they did of their parents. 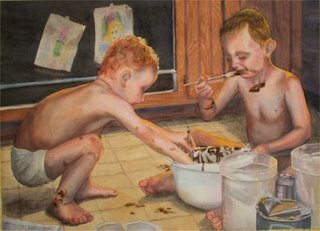 It was a wonderful treat for me to paint these sweet boys, doing what boys do best! Eating and making a mess, but having a good time at it. This is a 14" x 19" painting.